►Tell legislators to fund higher education NOW: The Massachusetts House/Senate Conference committee is determining funding for UMass and all other state agencies. The proposed House UMass allocation is less than a 1% increase and the proposed Senate allocation is a 3.5% increase. We need you to contact legislators to fund higher education at the higher Senate amount. The state cannot keep shifting the costs of college education onto the backs of our students. Already as you know nearly 400 of our non-tenure-track faculty received notices of non-reappointment in response to budget shortfalls. ‘Adequate funding for public higher education in Massachusetts is essential for ensuring that the Commonwealth has the skilled workforce it needs, that its citizens can participate in the knowledge-based economy, and for the growth of the Commonwealth. Four hundred faculty at UMass Boston were given notices of non-reappointment—a third of the faculty. Not renewing 400 hundred faculty hurts our students by limiting the choice of classes, increasing class size and delaying graduation. As a UMass faculty member, I have seen the decline in support from the state lead to higher tuition and fees and now fewer faculty. 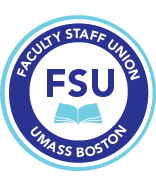 I am eager to provide an education of the highest possible quality to my students, and that requires adequate funding to maintain the faculty and staffing levels we currently have at UMass without shifting even more of the burden to students and their families through tuition increases. ● For activities around the budget cuts and NTT non-reappointments, please see here. ● Please send a statement to the FSU about these budget cuts and NTT non-reappointments. Tell us how these cuts have affected you. Let us know if you want to remain anonymous or if we can use your name- we want to post them on our website and present them to the Board of Trustees so they can be made aware of how damaging these cuts are. ● Please sign the Save UMB petition here. ● Please join the FSU organizing committee by emailing us.